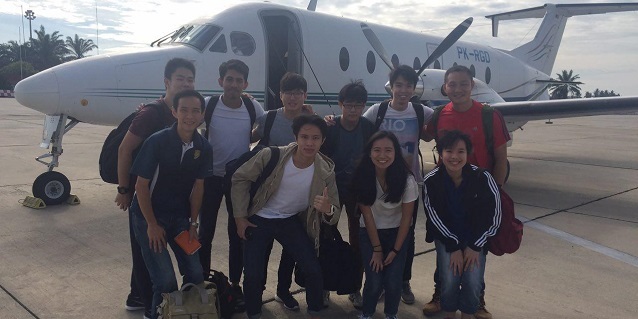 Several students from Singapore who won the 2015 CUBE challenge for urban design were rewarded with a visit to the town of Kerinci to see development in action. The town has grown rapidly in recent years and is home to the APRIL group’s extensive paper pulp operations which form part of Indonesian philanthropist and business leader Sukanto Tanoto’s RGE group. The young guests of the Tanoto Foundation were treated to several activities and presentations in Kerinci. According to participants Nicholas Wong and Timothy Koh, the most fascinating experiences of their trip were a nursery visit where the forestry process was explained in detail, and a fire safety seminar which explained the various causes of Southeast Asia’s complex haze problem. As part of Sukanto Tanoto’s commitment to foster intellectual curiosity in young minds, the APRIL group, a member of the RGE group of companies, has become a platinum sponsor of the CUBE challenge. This dynamic competition raises awareness about urban planning and design by allowing students from Southeast Asia to compete and create their own model solutions to current urban challenges. The student group expressed their appreciation for the opportunity to learn about paper manufacturing, with participants saying that their opinion of the industry improved greatly after seeing the socially and environmentally conscious initiatives that APRIL is carrying out. This learning experience is the kind of outcome that the Tanoto Foundation strives for in its support of talented young minds. Stay up to date on exciting projects like these by following Mr. Sukanto Tanoto via social media on Facebook, Twitter, Tumblr, About.me or LinkedIn.